The Outlander Sport is fun to drive! The Outlander Sport will stick to the ground on the sharpest of turns. With exceptional handling you will enjoy every curve of your favorite roads. The Outlander Sport has guaranteed financing. Salt Lake Mitsubishi?s customer loyalty program is designed to ensure customers are rewarded for repeat business and inviting their friends to shop at -dealerName-. - **Vehicle Options listed are when the unit was originally built. Please confirm the accuracy of the included equipment by calling the dealer prior to purchase. Get Approved in less than 60 seconds. No impact to your credit! http://bit.ly/60secondapproval We are committed to providing efficient, honest, and a knowledgable experience while you discover Mitsubishi. We bleed Mitsubishi and appreciate your interest in our brand. Our Mitsubishi certified staff is here to wait on your every need. We want to see you in a mitsu! This unit's tough strong personality is reflected in its rugged exterior design. There are few comparable vehicles that match this Mitsubishi Outlander Sport?s style and sophistication. - **Vehicle Options listed are when the unit was originally built. Please confirm the accuracy of the included equipment by calling the dealer prior to purchase. It has amazing acceleration and passing capabilities. Get Approved in less than 60 seconds. No impact to your credit! http://bit.ly/60secondapproval We are committed to providing efficient, honest, and a knowledgable experience while you discover Mitsubishi. We bleed Mitsubishi and appreciate your interest in our brand. Our Mitsubishi certified staff is here to wait on your every need. We want to see you in a mitsu! This small suv has guaranteed financing. - **Vehicle Options listed are when the unit was originally built. Please confirm the accuracy of the included equipment by calling the dealer prior to purchase. The vehicle is front wheel drive. It shines with clean polished lines coated with an elegant white finish. This 2019 Mitsubishi Outlander Sport sips fuel. The vehicle is fun to drive! The performance tuned suspension of this vehicle handles great on all turns. Good credit or bad credit, we can get you a great loan! - **Vehicle Options listed are when the unit was originally built. Please confirm the accuracy of the included equipment by calling the dealer prior to purchase. The Outlander Sport is fun to drive! Thanks for checking out our vehicle online. Please come and visit us at 3734 S State St, Salt Lake City, UT or give us a call at (801)266-3734. Salt Lake Mitsubishi's mission is to ensure all our customers have a positive auto buying experience and are completely satisfied with their new vehicle. - **Vehicle Options listed are when the unit was originally built. Please confirm the accuracy of the included equipment by calling the dealer prior to purchase. Good credit or bad credit, we can get you a great loan! Save big with the special financing rates and terms are being offered. You will immediately be impressed by the curb appeal of this model. The powertrain is very reliable. Get Approved in less than 60 seconds. No impact to your credit! http://bit.ly/60secondapproval We are committed to providing efficient, honest, and a knowledgable experience while you discover Mitsubishi. We bleed Mitsubishi and appreciate your interest in our brand. Our Mitsubishi certified staff is here to wait on your every need. We want to see you in a mitsu! - **Vehicle Options listed are when the unit was originally built. Please confirm the accuracy of the included equipment by calling the dealer prior to purchase. This small suv sips fuel. The performance tuned suspension of this unit handles great on all turns. The vehicle comes standard with numerous top of the line safety features. Special financing terms are available. Ask about our great rates! Refined elegance is exemplified by sleek exterior styling. - **Vehicle Options listed are when the unit was originally built. Please confirm the accuracy of the included equipment by calling the dealer prior to purchase. This unit has guaranteed financing. Elegant lines project confidence from it. Heads will turn. This model has a ton of curb appeal. Get Approved in less than 60 seconds. No impact to your credit! http://bit.ly/60secondapproval We are committed to providing efficient, honest, and a knowledgable experience while you discover Mitsubishi. We bleed Mitsubishi and appreciate your interest in our brand. Our Mitsubishi certified staff is here to wait on your every need. We want to see you in a mitsu! - **Vehicle Options listed are when the unit was originally built. Please confirm the accuracy of the included equipment by calling the dealer prior to purchase. Save big with the special financing rates and terms are being offered. You will immediately be impressed by the curb appeal of this unit. Get Approved in less than 60 seconds. No impact to your credit! http://bit.ly/60secondapproval We are committed to providing efficient, honest, and a knowledgable experience while you discover Mitsubishi. We bleed Mitsubishi and appreciate your interest in our brand. Our Mitsubishi certified staff is here to wait on your every need. We want to see you in a mitsu! - **Vehicle Options listed are when the unit was originally built. Please confirm the accuracy of the included equipment by calling the dealer prior to purchase. We offer guaranteed financing regardless of credit history on this Mitsubishi Outlander Sport. Get Approved in less than 60 seconds. No impact to your credit! http://bit.ly/60secondapproval We are committed to providing efficient, honest, and a knowledgable experience while you discover Mitsubishi. We bleed Mitsubishi and appreciate your interest in our brand. Our Mitsubishi certified staff is here to wait on your every need. We want to see you in a mitsu! - **Vehicle Options listed are when the unit was originally built. Please confirm the accuracy of the included equipment by calling the dealer prior to purchase. Special financing terms are available. Ask about our great rates! You will immediately be impressed by the curb appeal of it. It flexes with muscular bold lines. Enjoy your driving more! This is one of the most exciting vehicles to drive in its class. The vehicle will stick to the ground on the sharpest of turns. With exceptional handling you will enjoy every curve of your favorite roads. It comes standard with numerous top of the line safety features. - **Vehicle Options listed are when the unit was originally built. Please confirm the accuracy of the included equipment by calling the dealer prior to purchase. Good credit or bad credit, we can get you a great loan! Special financing terms are available. Ask about our great rates! This model has a L4, 2.0L; DOHC 16V high output engine. The vehicle gleams with a flashy red exterior. This model is equipped with a gasoline engine. Thanks for viewing Salt Lake Mitsubishi's exclusive listings. - **Vehicle Options listed are when the unit was originally built. Please confirm the accuracy of the included equipment by calling the dealer prior to purchase. The speed and passing capabilities of it will impress. It is fun to drive! Salt Lake Mitsubishi is committed to 100% customer satisfaction, no exceptions. You are always welcome to visit our showroom for a hassle free low pressure shopping experience. Good credit or bad credit, we can get you a great loan! - **Vehicle Options listed are when the unit was originally built. Please confirm the accuracy of the included equipment by calling the dealer prior to purchase. This model has a L4, 2.0L; DOHC 16V high output engine. It is front wheel drive. Special financing terms are available. Ask about our great rates! Thanks for checking out our vehicle online. Please come and visit us at 3734 S State St, Salt Lake City, UT or give us a call at (801)266-3734. Call today to schedule a vehicle showing with an experienced Salt Lake Mitsubishi consultant. If you have a quick question about this unit, don?t hesitate to call. - **Vehicle Options listed are when the unit was originally built. Please confirm the accuracy of the included equipment by calling the dealer prior to purchase. Save big with the special financing rates and terms are being offered. You will immediately be impressed by the curb appeal of this 2019 Mitsubishi Outlander Sport . Protect the paint of this Mitsubishi Outlander Sport from needless damage with an aftermarket clear bra. Get Approved in less than 60 seconds. No impact to your credit! http://bit.ly/60secondapproval We are committed to providing efficient, honest, and a knowledgable experience while you discover Mitsubishi. We bleed Mitsubishi and appreciate your interest in our brand. Our Mitsubishi certified staff is here to wait on your every need. We want to see you in a mitsu! - **Vehicle Options listed are when the unit was originally built. Please confirm the accuracy of the included equipment by calling the dealer prior to purchase. This Mitsubishi Outlander Sport has guaranteed financing. 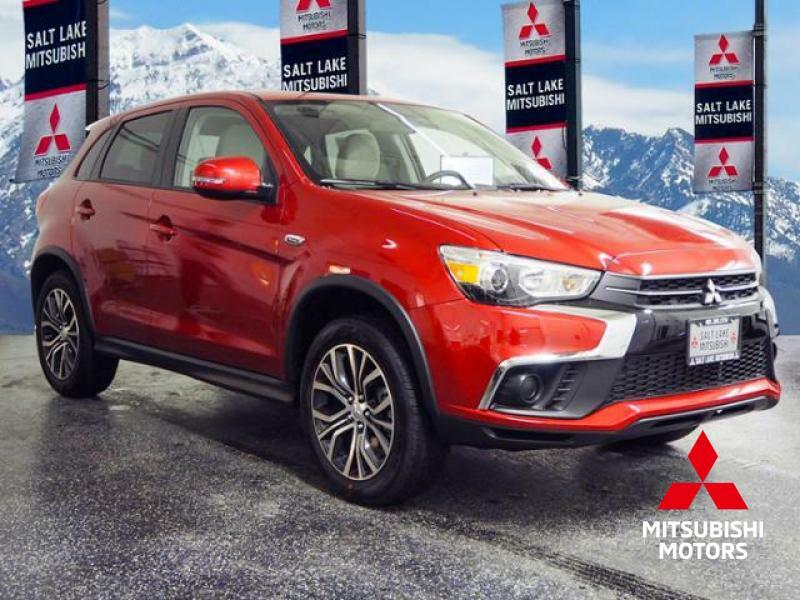 A qualified Salt Lake Mitsubishi sales consultant is available by phone to answer any questions you may have about this vehicle. Salt Lake Mitsubishi is committed to 100% customer satisfaction, no exceptions. Thanks for checking out our vehicle online. Please come and visit us at 3734 S State St, Salt Lake City, UT or give us a call at (801)266-3734. - **Vehicle Options listed are when the unit was originally built. Please confirm the accuracy of the included equipment by calling the dealer prior to purchase.